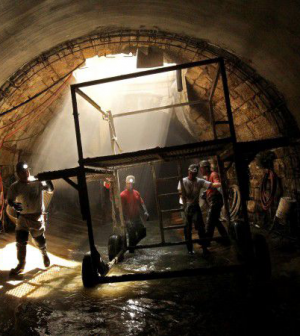 From STLToday: The contract to build the Deer Creek tunnel was one of the largest the Metropolitan St. Louis Sewer District had awarded in years. Two big firms were competing hard in 2017 to land the $150 million project. Sewer district staff recommended awarding it to the low bidder, a joint venture led by an out-of-town firm, Jay Dee Contractors. The district board’s practice, almost without exception, was to approve the professional staff’s recommendation. SAK Construction, a St. Charles County company that was competing with Jay Dee for the business, mounted a lobbying effort with district staff and board members. The company’s concerns reached St. Louis County Executive Steve Stenger’s office, which appoints three of MSD’s six members on its Board of Trustees. A top aide to Stenger met with two key trustees to discuss the matter, the Post-Dispatch has learned. After the meeting with Stenger’s aide, one of those two MSD trustees switched his vote, and SAK ultimately won the contract. The board member did not explain why. And the controversial vote — which garnered headlines at the time — quietly receded from public notice. Then, not a month after that vote, SAK executives did something they’d never done before: They began pouring money into Stenger’s campaign. A review of campaign disclosure records by the Post-Dispatch shows that SAK, its executives, their family members and companies associated with them have since given at least $88,000 to Stenger. Executives of a subcontractor on the bid, Goodwin Brothers Construction, gave at least $65,000 more. Together, the donations account for more than 3 percent of Stenger’s record haul of almost $4.8 million during his successful 2018 reelection campaign. His spokesman, Cordell Whitlock, said many companies donated to the county executive’s campaign and referred questions about SAK’s donations to the company. An SAK executive, reached at his home in Lake Saint Louis last week, declined to say why he and his company have donated to Stenger.